Personal Injury Attorney, John R. Howie, Jr.
John R. Howie, Jr.is an accomplished trial attorney who focuses his practice on vaccine injury and personal injury cases, including trucking and auto accidents, bad faith insurance practices, product liability, premises liability, medical negligence, nursing home litigation, consumer protection and breach of contract cases. He graduated with a BBA from Southern Methodist University in 1994 and went on to graduate from SMU Dedman School of Law in 2000. During law school, he served as the Notes and Comments Editor (1999) and Co-Managing Editor (2000) of The International Lawyer. John was admitted to the State Bar of Texas in 2000. He is also a member of the Tarrant County, Dallas County and American Bar Associations, and is admitted to practice before all Texas state courts as well as the U.S. District Court for the Eastern District of Texas. He is a member of the Dallas and Tarrant County Trial Lawyers Associations, American Trial Lawyers Association and Dallas and Tarrant County Associations of Young Lawyers. 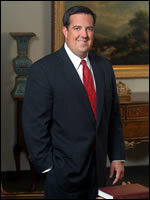 He is a sustaining member of the Texas Trial Lawyers Association.